Solstice Chronicles: MIA. Just look at it. It’s a perfect opportunity to shoot so many monsters right in the whole body. Are they zombies? Are they alien-virus-infected humans? I don’t know, maybe both — I’m pretty sure they’re definitely the latter — either way, it doesn’t matter, because all you need to know is that their bodies crave bullets, and you have bullets to spare. So give the meat monsters what they want. Deliver it to them. Ship the bullets to them express with your variety of automatic and semi-automatic bullet shipment devices. Do it. It’s good for you. Also, did I say you have bullets to spare? That’s absolutely not true and is entirely hyperbolic. You only have bullets to spare early in the campaign. You have a lot of bullets, don’t get me wrong, but even on normal difficulty, you will absolutely be able to use all of them and have to run around looking for more while you get good at hitting things with your knife (which you may do even when you have bullets, because it’s quite rewarding on a visceral, psychological level). “But how,” you might ask, “am I going to spend 999 bullets in a single level? I understand fire control, not just shooting wildly until the clip empties.” It’s simple: much like this title’s predecessor and another title I reviewed, Helldivers, you’re going up against an endless tide. An infinite number of enemies stand against you, and you will never be able to kill all of them; instead, you’ll be moving through the map trying to complete objectives, explore, and — most fundamentally — survive. Also, downtime isn’t a thing in this title. Unless you find a little outpost just bristling with turrets, your wits would best kept about you, as, in their single-minded push to annihilate you, the literally constant influx of enemies can easily overwhelm a single turret emplacement specifically. The mobs do ignore the turrets, by and large, but that means they’re honing in on you, exclusively. “Whatever,” you might think, “I can still handle these meat scrubs.” You’re not wrong. Most of the monsters are fairly weak, dying with only a shot or three but, again, numbers rule the day. A shot or three is still your entire clip when it’s thirty enemies coming at you. And it gets worse: the longer you go, the more you increase the global “threat level,” which causes not only more enemies to spawn but also some that aren’t such pushovers. 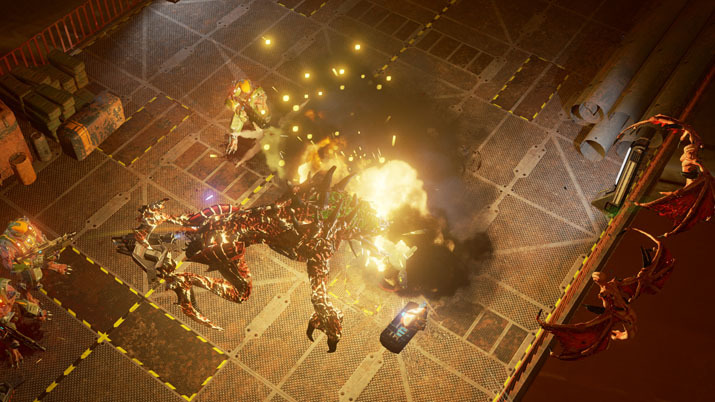 We’re talking dangerous, ranged mutants, aggressive close range bruisers with nasty jump attacks, and veritable mountains of meat that serve as bosses and summon even more mobs to hunt you. Of course, if you kill hard and fast enough, you can keep the threat level from increasing, but some map objectives raise it automatically and, once it’s up, killing won’t drop the level again, only prevent it from rising further. Does that sound impossible? Does it sound like an unfair system where you’re inevitably going to end up with a huge amount of threat and swarms of enemies hunting you? Well, that’s exactly what it would be, if you didn’t have a little trick to help manage that threat level. You see, you’re not in it alone, through the campaign you have a robotic side-kick who does a number of useful things, most involving manipulation of the threat level. She can harvest items and ammo from across the map, raising it, or summon a gaggle of more dangerous foes, lowering it — if you can best them. She can also summon both a bomb and a blocking zone that keeps out the small fry and slows big-bads in an area. That traditional gaming story-telling mechanism that you love, hate, and tolerate: cutscenes. Still, the gist of the plot is hard to miss. Essentially, she and you are both working together to escape from behind enemy lines after being captured by the monster horde. Disregarding, for a while, the logical leap required to accept that they wouldn’t just kill and eat you right away, you awaken to find yourself ensconced in their meaty fun-dungeon — presumably to be mutated into an extra meaty monster yourself — and are quickly freed by this curious bot. You discover in very short order that she’s a member of the resistance movement that you’ve been against, but desperate times make strange allies, and you both have other, meat-monstery things to worry about in that moment. Almost all of this is laid out for you in the first couple minutes of the game after the introductory last stand level by means of that traditional gaming story-telling mechanism that you love, hate, and tolerate: cutscenes. The cutscenes aren’t overbearing, from a volume of content perspective — certainly not on the level of something like the Metal Gear Solid series. There are usually just a couple in each level, generally at the beginning and end of the mission, giving you some perspective on why you’re express-mailing bullets to monsters in that particular level — in as much as the why is ever something more than, “they’re monsters who want to eat me, so I kill them.” It never really has to be, but Ironward goes the extra mile of having an actual story to tell in a genre that doesn’t need it. That said, the actual narrative they put forward is acceptable, not revolutionary, and if you have experience in the sci-fi and fantasy genres of gaming, comics, or literature the hero’s journey will come across fairly unadorned. That happens to be an apt descriptor on the audiovisual front, as well, as the graphics, art, sound, and music are top notch, but ultimately lack the raw technological and stylistic oomph to stand out, and don’t serve an aesthetic or motif that hasn’t been done before. And there’s nothing wrong with that. 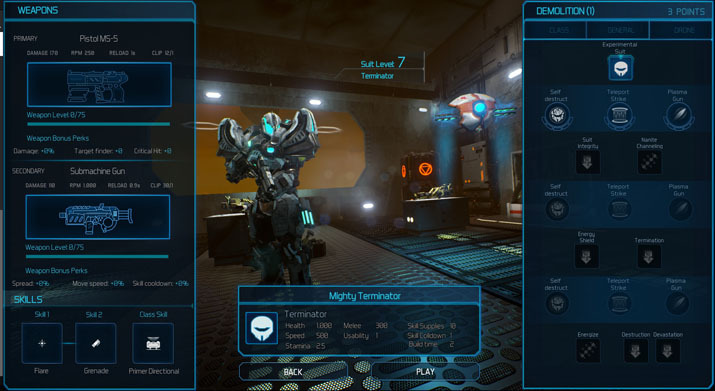 Solstice Chronicles: MIA does what it sets out to achieve: it provides an intense, fast paced experience for single player and co-op. The title gives you plenty of tools to fight and manage the mutants, as well as a system to level up and customize your character as one of a number of classes. Even your guns level up and improve differently as you use them, so there’s plenty of leeway to respond to its onslaught in the way you like. “Game-play first,” then, is another apt descriptor. Perhaps Solstice Chronicles: MIA possesses a solid game-feel, or perhaps it would just be enough to say that I actually had fun playing it. It seems simplistic, but having spent an unconscionably large part of my life playing and thinking about games, I’ve come to accept that there are many games that I merely don’t mind playing, while very few that I actually have fun with and return to over and over again. So then, Solstice Chronicles: MIA, with a compelling horde-onslaught management experience, solid technical and audio-visual fundamentals, and a passable story, is something I intend to return to and confidently recommend. So, go ahead and ship those meat monsters their bullets. It’s good for you.